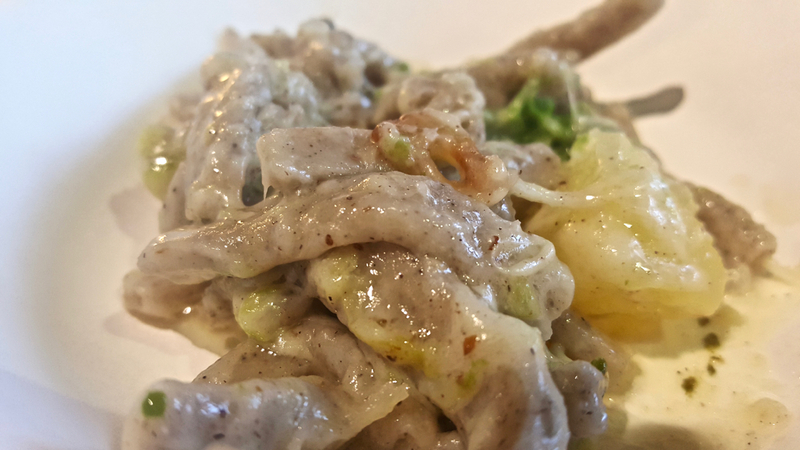 Recently has been gained PGI recognition for pizzoccheri of Valtellina as a typical preparation of the province of Sondrio, in Lombardy. Feature of this preparation, which can be marketed both fresh and dried, is being prepared with buckwheat flour. According to the specification buckwheat flour must be al least 20% of the blend with other flours. But in homemade fresh pizzoccheri this amount is about 80%. The presence of buckwheat gives pizzoccheri of Valtellina the characteristic dark color. When the percentage of buckwheat flour is very high the pizzoccheri should be consumed ready made. The pasta can be in the format ‘tagliatello stretched “ie thin flattened lists of variable length and width in the stretched form, in” tagliatello wrapped “ie thin flattened lists of variable length and distributed width in wrapped form, or” dumpling “ie to take the characteristic concavity. The typical pizzoccheri condiments are also linked to local products to be found in the area such as butter, cheeses, vegetables (cabbage and other seasonal vegetables such as chard or green beans), and potatoes. The name, pizzoccheri, seems to derive from “pit” or “piz” which means piece. The homemade pasta of the classic recipe of pizzoccheri mix buckwheat flour and water, adding only a little flour 00. Once mixed the ingredients la pasta must be wrapped and left to rest for about half an hour. The paste is then stretched and folded over on itself in layers, dusted of flour because it does not stick, and cut into strips about one centimeter width and long 10 or 15 cm. The classic condiment of pizzoccheri is prepared washing the vegetables such as cabbage or chard, (which can be taken away from the harsh coast), and putting them to boil in water to which you add the potatoes into chunks and finally, at the right time, the pizzoccheri. After a few minutes of cooking drain it all and put them in layers in a bowl alternating with grated parmesan cheese and cheese from Valtellina, in particular Valtellina Casera DOP. It is completed spraying with melted butter aromatised with garlic and with lots of fresh pepper.